We first met when the doorbell rang a few days before Christmas and there, on the front porch, with nothing but a big red bow around her little puppy neck, sat Holly. She wriggled and licked her way into my heart and stayed there for almost 14 years. 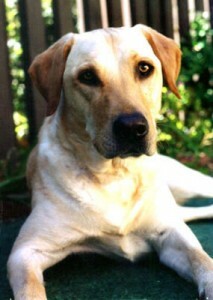 Holly was the sweetest Yellow Lab who ever lived. She always had a big smile on her face and greeted everyone she met with a wagging tail. If there were a “Good Will Ambassador” for big-hearted, loving canine’s, Holly would be it. I never once saw her show aggression or anger toward anyone, human or canine. She was a big agility fan. She loved to go to practices and agility shows to cheer on her little sister Violet. As a young dog, she loved to crash through the waves at the beach, tried out for a Flyball team (too much fun to take seriously!!! ), loved to retrieve trout from my fishing line while in the Sierra’s and every morning she brought in the newspaper.